Our latest case study on ABAQUS/Explicit scalability is out! 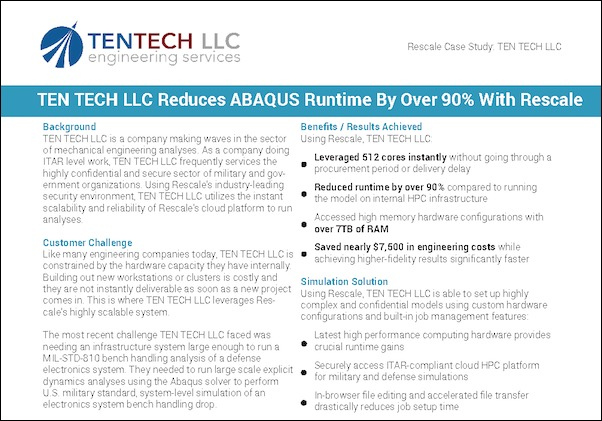 We just published our joint Case Study with Rescale on Abaqus/Explicit scalability. As expected, Abaqus solution time decreases quasi-linearly with the number of cores. The particular example we highlighted was a MIL-STD-810 bench handling analysis. We were able to shave off 90% of the solution time by running on Rescale's large scale HPC Cluster. Head on to our Whitepapers Section or download the case study directly: Abaqus/Explicit High Scalability Case Study.